I had a lovely surprise the other day. I received two beautiful picture books in the mail. 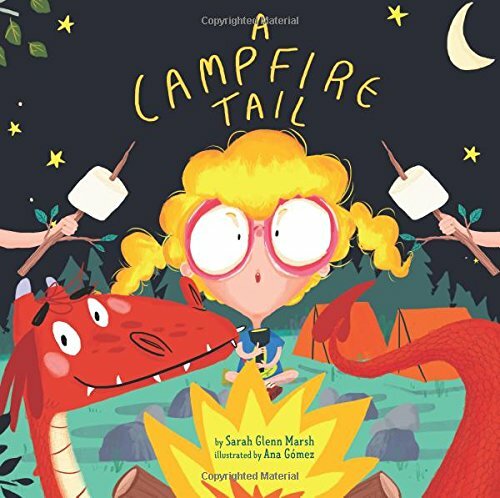 Written by author Sarah Glenn Marsh, they are bright and bold and so much fun. I knew I had to share them with you today. One is about taking selfies. How awesome is that! And the other is about camping and finding the courage to be a real friend. And because my bookshelves are overflowing, I plan to give both of these away. So please make sure you leave a comment. And don’t hop off until you scroll through the entire post BECAUSE after the picture book review, I’ll be giving everyone a heads up about #50PreciousWordsforKids which is COMING ON MONDAY!!! You can’t take the perfect selfie if you’re all by yourself. 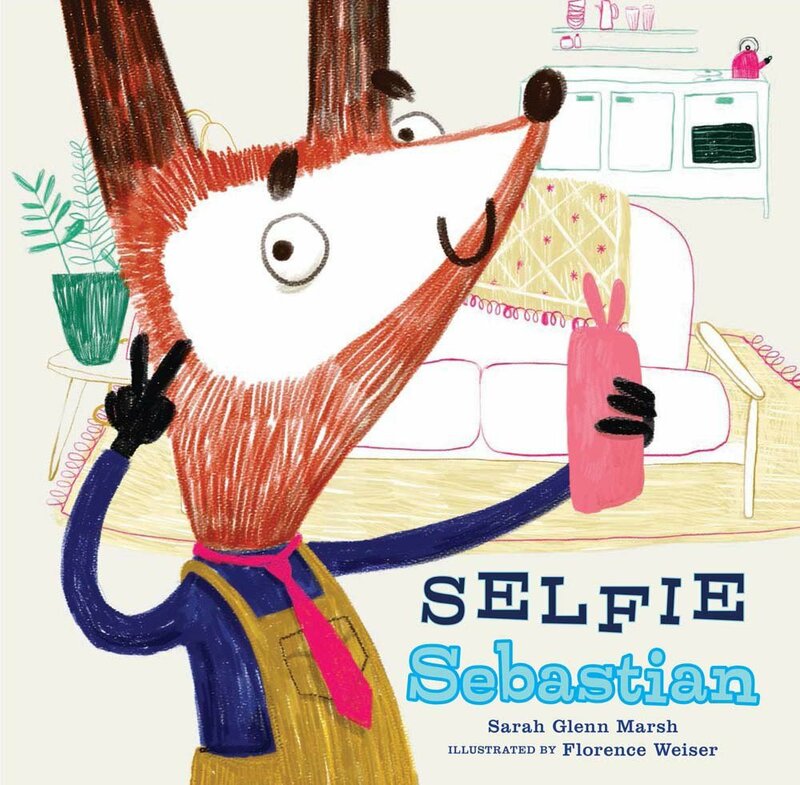 Sebastian is one handsome fox—and he really, really loves to take selfies. But somehow, no matter how camera-ready he is, his pictures always lack a certain something. And he can’t put his paw on exactly what. So Sebastian sets off on an elaborate quest to take the perfect selfie, dashing from a glamorous red carpet in Hollywood to the vast expanse of the Grand Canyon. He even zooms to the Moon! Still, none of Sebastian’s photos make him happy. Could it be that the secret to his special selfie is right where he started . . . at home, with his friends? I loved the relevant theme of taking a selfie…even young kids want to do it. I enjoyed the travel/geography layer to the story – kids will love to guess where Sebastian is. GREAT illustrations – the front and back covers are amazing! Ever been stuck with a friend who’s totally uncool—and worried that it will rub off on you? Welcome to Camp Wildwood! It’s Dragon’s first day, and his buddy would LIKE to show him a good time. But Dragon doesn’t seem to fit in with the boys and girls. He overturns the boat, ruins the puppet show, and even sets the tent on fire. Then, just as his buddy is about to give up, Dragon comes through in a pinch. This sweet, funny picture book teaches an important lesson about the true meaning of friendship—and in accepting the strengths and weaknesses of others. The illustrations are fantastic…just love the main character! Text is full of heart and humor…great combination for a picture book! Make a list of how to be a good friend. Take selfies with friends and create an album of friendship. Role play with your kids…different scenarios where being a good friend might be difficult. Please don’t forget to leave a comment to be entered into the giveaway. If you’d like to see more picture book reviews, please go to Susanna Hill’s Perfect Picture book Friday link up. And remember the best gift we can give the authors of our favorite stories is to buy their book or ask the library to order their book or write a review on Amazon or other book review sites. And now, dear friends, a few words about #50PreciousWordsforKids! Last year, I hosted an international writing challenge for kid writers in grades K-6. I invited them to create a story for children in 50 words or less. #50PreciousWordsforKids drew participants from 15 states and 4 foreign countries. What amazed me was the incredible creativity that was unleashed by the restrictive word limit. Click here to see the stories from last year’s challenge. MAGIC HAPPENS WHEN YOU MAKE EVERY WORD COUNT! As a former kindergarten teacher, I’ve always been on a mission to help kids become lovers of books and reading. What a thrill it was to invite them to become their own storytellers! This writing challenge is ALL-INCLUSIVE and INTERNATIONAL! #50PreciousWordsforKids coincides with Children’s Book Week, April 30-May 6. Every child in grades K-6 is invited to participate. Teachers can have each child write a story of 50 words or less…then the teacher and/or class will choose one story to submit. Last year, some classes formed teams and wrote collaborative stories – that is totally fine. Parents who homeschool their children can submit one story per child. The official #50PreciousWordsforKids post will go live on Monday morning! Each child, grade K-6, writes a story of 50 words or less. Title not included in word count. Story must have a beginning, middle, and end. Happy or sad, silly or serious, true or make-believe. Teachers/students choose one story to submit per class. Homeschooling parents submit one story per child. Please email story to: viviankirkfield@gmail.com by May 7 at 11:59pm. Stories post on my blog: viviankirkfield.com on May 11. Teacher/parent receives a certificate to copy and present to each child who wrote a story. Giveaway of seven mini-Skype author classroom visits. I’m asking all of you who have connections with elementary schools or homeschooling families in any state and any country to please spread the word. Last year, I contacted the Children’s Book Council and they agree – it’s a perfect activity for Children’s Book Week. Click here to read last year’s stories. The challenge runs April 30-May 6 and the stories need to be emailed to me: viviankirkfield@gmail.com by 11:59pm Eastern Standard Time on Monday, May 7th. I’ll post those stories on Friday, May 11th. Teachers and parents will receive a certificate that can be copied and personalized with the name of each child who participated. And there will be mini-Skype author classroom visits randomly awarded—one per grade level if I get enough volunteers. Let’s help our kids stretch and grow their imaginations. Which brings me to the next request…I still need volunteers to do mini-Skype author or illustrator visits. If you would like to donate a mini-Skype author or illustrator visit, please contact me ASAP either by email or on FB or Twitter. It’s a wonderful way to connect with our audience of parents, teachers, and kids!